Ice Cream Man #5 Review – AiPT! Break time is officially over, as W. Maxwell Prince and Martín Morazzo are back to continue the darkest story in comics. Ice Cream Man is probably the darkest book in all of comics right now. Drug overdoses, kids killing their parents, ice cream acid trips, and weird torture in the afterlife. It makes sense that after such relentless hits, we’d need a breather and so the book has been on a mini-hiatus since April. 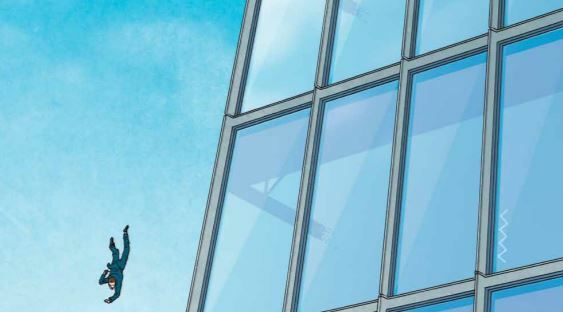 Well kids, break time is officially over as W. Maxwell Prince and Martín Morazzo are back to continue the story of the diabolical titular character and those affected by him, and judging from the cover featuring a man jumping off a skyscraper, they will pick up right where they left off. Unlike previous issues, where we got to know and love characters right before the Ice Cream Man swooped in to ensnare them, this time the damage has already been done and a man is about to jump off a building thanks to the encouragement of the Ice Cream Man. Through the falling man’s inner monologue, we find that the Ice Cream Man has changed tactics. After he was threatened by the mysterious cowboy at the end of issue #4 and told to stop bothering people “in this town,” he has set his sights upon the big city instead and has acted upon his previous allusion to a vulture eating people’s brains out, by literally transforming into a vulture. We see the fallout through the thoughts of Bill, the falling man, and the experiences of Veronica, a woman working in the building who appears to be in the wrong place at the wrong time and caught up in all this. As Bill begins his descent, inside the building the Ice Cream Man has taken vulture form and is eating the brains of an executive. And somehow, everyone else in the building has lost their minds like Bill, except for Veronica, who is forced to try and escape from everyone and everything. For most of the rest of the issue, we switch between moments of Bill confessing his sins on the way down and Veronica escaping from increasingly screwed up colleagues. The mysterious cowboy resurfaces again, and by the end of the issue the shape of this story’s puzzle becomes clearer than ever. The introduction of the cowboy in issue #4 and his presence in this issue makes us realize that there’s a larger game that is being played out between some form of good and evil, embodied by these two spirits who cloak themselves in classic archetypes. One thing stood out to me in this issue: the morality of the world of Ice Cream Man is revealed to be black and white (literally, judging by the color of the Ice Cream Man and cowboy’s uniforms (but more contradiction – the good guy is cloaked in black, while the bad guy dresses in white)). The truly innocent are protected (if not spared) while those with even the slightest hint of sin are driven mad. There’s certainly more to how it all works, but Prince is going to take his sweet time in revealing how it all fits together and the pacing is perfect. In the meantime, we’ll have to be content with increasingly dark deep dives into the psyche of humanity and trying to decipher staggering amounts of symbolism. No one does expressions in comics right now quite like Morazzo. I’m also reading his work in She Could Fly, and the way he draws looks of horror, shock, solemnity, and creepy smiles is unparalleled. Here’s a dirty secret – most artists in comics can only manage a few emotions on their characters, but Morazzo puts nearly all of them to shame. Beyond that, Chris O’Halloran busts out of his neat coloring scheme where previously, each issue followed a set tone, to throw a variety of different visual themes at us. Reflecting the reality of life, sometimes scenes are set in darkness, sometimes they are full of light, in other cases the color is not really relevant to the art at all. Could it be that the pace of the coloring and the shifts in its direction are deliberately following the progression of the story, where we are beginning to learn that not everyone should be painted with the same brush? Just about the only knock I have is with the gratuitousness in this issue. In one issue, we see an eyeball being plucked out, brains being eaten, guts being spilled and severed heads. While the story has always been pretty dark, up until now it got the message across without needing to go heavily down the blood-and-guts route. The worst we got was in the first issue, seeing some slightly decaying bodies. Beyond that, the message got across on the strength of sadness and misery. I will say Morazzo is no stranger to drawing brutal violence; he’s done it in books like The Electric Sublime and he’s doing it currently in She Could Fly and it’s worked well. But it’s always seemed tasteful up to this point. I hope that this issue isn’t a sign of the story needing to resort to cheap tactics to keep things interesting. Let’s hope this is just a one-time thing and it doesn’t go over the edge in the future. Ice Cream Man does not follow conventional comic book wisdom in 2018. It will read well as a trade paperback but it is also incredibly satisfying being read issue by issue. It is touted as an anthology, with each issue standing on its own. At the same time, there is an overarching story and struggle that becomes clearer with every chapter and has taken real shape in this issue, with the cowboy making good on his threat to the Ice Cream Man at the end of issue #4. In that sense, this series is a walking contradiction, but this is totally consistent with the written and visual nature of the stories where the characters and their actions have the same contradictory and hypocritical nature. Just about the only knock I have is with the gratuitousness in this issue; there's a fine line between shock and tastelessness.